When two strings are almost (but not quite) in tune with each other, a rhythmic pulsation occurs as the strings move in and out of step. For example, if one string is vibrating 100 times per second, and the other is vibrating 101 times per second, the combined sound of the two strings pulsates, going louder and quieter once every second. In scientific terms, this is called heterodyning, but it is more commonly known as a BEAT. Beats could perhaps be compared to two clocks which are ticking at slightly different rates, and produce their loudest tick when in step, but fight against each other when out of step. The rate of the beat gives a precise measurement of the difference in frequency, not only for 2 strings tuned to the same note, but also for different notes at certain intervals to each other. Tuners rely on beats as a measure of accuracy, but sometimes, a single string produces a beat on its own, and this is known as a FALSE BEAT. Some electronic tuning devices do not know what to make of such notes. 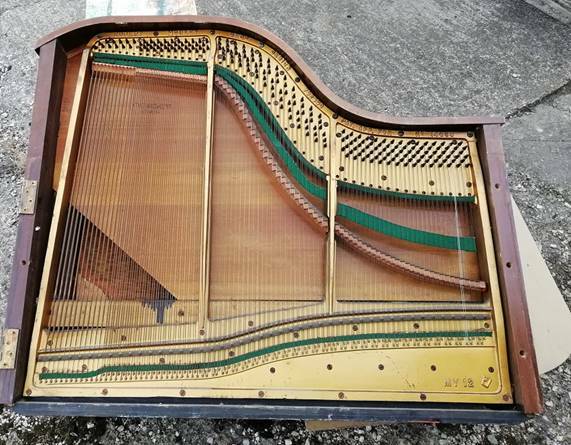 Piano designers and technicians have struggled to understand the cause of false beats, and have been investigating and debating the causes of falseness for over a century, although no conclusions were reached. Makers have developed many modifications in an attempt to avoid it, but it seems that, far from being a sign of inferior manufacture, the better the piano, the more likely it is to suffer from false beats. I began to think of it in terms of the soundboard acting as an amplifier, and realised that the better the quality of the amplifier, the more it will tend to show up faults which are there naturally. This falseness should be thought of as a characteristic rather than a fault, and although it can present a major annoyance for tuners, I have to admit (begrudgingly!) that some people regard it as quite desirable, and say it gives a “singing quality”. Some electronic imitations now incorporate a beat into the piano sound they produce. It is often said that false beats are caused by out-of-tune harmonics, but I have never been convinced by this argument, because all pianoforte strings have some of those, and a particular string can sometimes be cured of its false beat. Conversely, changing the string doesn’t always fix it, so it seems unlikely that anything in the individual piece of wire is to blame. In trying to find the cause of natural false beats, I looked at various ways that a beat might be simulated artificially: If the string was only producing one note, the most likely possibility was that the note was being modulated by some lower frequency, like the tremulants on organs and synthesisers. If so, what was the source of this lower frequency? Replacing the string sometimes seemed to cure the problem, so surely it couldn't be the overall design of the piano, or that individual note? Just twisting, or slackening off and re-tensioning sometimes worked, so it couldn't be faulty wire, but nothing seemed reliable. When I was tuning hundreds of pianos a year, I used them as a source of information on all aspects of pianos, doing surveys, and in the seventies, when I first began to look at the problem of measuring the degree of falseness, my attention was drawn instead to the rate of the false beat - the number of beats per second. This diagram represents the top ends of the strings of a few notes in the treble of an upright piano. The brass pressure bar is part of the bridge, and the portion of each string between it and the wrestpin is called the TOP-STRINGING. The lengths of top-stringing for one note are often very roughly in the ratio 3:2:1, and the falseness tends to be worse on the left-hand string, which has the longest top-stringing. Sometimes the rates of false beats in those strings are in a ratio very close to 2:1:0. In grands, where the whole arrangement is turned around the other way, falseness is more prevalent in the right-hand strings which, again, have the longest top-stringing. When I was collecting data about the rate of the false beats, I noticed that, as a rule of thumb, the maximum frequency of the beat would be roughly in the order of 1% of the frequency of the note: If Middle A vibrates at 220 Hz, it could only have a very slow beat, perhaps a couple of beats per second. On the other hand, Top A, with a frequency of 3520, could sometimes produce a tremendously fast beat, perhaps more than 30 Hz, so fast that it was difficult to recognise it as such, and it almost became a note in itself, a sort of “sub-harmonic”. But if the false beat’s frequency varies so much from string to string on one note, how could it have any relationship to the frequency? Was there some hidden factor? As I listened harder, to more strings, I began to realise that the difficulty was in deciding what strength or amplitude of false beat was acceptable, and if I listened carefully enough, there was an audible (if feint) beat in almost every string, and not just piano strings, but any freely vibrating strings which were not bowed or otherwise interfered with. Could there be false beats in all piano strings? Or all strings? Or all notes? Being restricted to 2 dimensions, books illustrate vibrating strings as if they move up and down the page, in a single plane - flat by definition. Understandably, many people have come to accept without question that this is reality. If you could look at the string end-on, you might expect that it would vibrate in a straight line. In a grand pianoforte, the hammer strikes the string from below, and it would be logical to expect the reaction to be a vibration in a simple vertical line. Similarly, a plucked string might be expected to return through its point of rest, and continue back and forth in a straight line, diminishing in amplitude. In practise, it is impossible to strike or pluck the string as precisely as that anyway, and hammer shanks also tend to twist quite visibly. My observations with low-tension strings on guitars and other instruments suggest that the plane of vibration of the string rotates, giving a three-dimensional aspect, and when viewed from a fixed angle, the string often appears to pulsate, varying as it does so from a wide swing to almost a straight line - and yet sounding much the same at moments when there is no visible swing at all. I constructed several very simple models, using rubber ropes, or stiff wire fixed at only one end, in an attempt to simulate a magnified, slowed-down "string" which would allow me to look end-on at the centre of its vibration. I had grave reservations about the validity of such models, but one has to start somewhere, and I was gratified to learn that later work done by Gabriel Weinrich at the University of Michigan with expensive laboratory equipment supported my initial findings: Weinrich discovered that its vertical vibration did indeed diminish slowly, but its lateral vibration (left to right) actually increased for a while, before dying away as expected. This diagram, based on results from my own Heath-Robinson equipment, concurs with this but goes a little further in suggesting a more precise pattern of behaviour for a piano string. The overall distance traced by the string is gradually shrinking, but look at the shapes: when struck from below by the hammer, the string appears to be moving up and down in a vertical line, but it soon becomes clear that it is opening out into an ellipse, and although the circumference of the shape is shrinking, the width actually increases for a while. It continues to do so until the string is vibrating in a circular motion, which suggests that all the forces are equalised, then the shape remains unchanged as the sound decays to nothing. From the original straight line, it would open out into an ellipse, then a circle, (as before) but then it would spread out into another ellipse, this time roughly at right-angles to the first one, and this would thin out to become a line. The process would then reverse itself, or at least appear to, continuing back and forth along the sequence of shapes as it gradually diminished in amplitude. At each change of direction, it is impossible to say whether it reversed its rotation, or turned a further 90 degrees, but it seems more likely that the rotation continued onwards in the same direction. For anyone with the slightest understanding of acoustics, it is not difficult to imagine the effect of this changing direction upon the sound. It is similar to the principle of the Leslie rotating speaker used in electronics organs, which generates complex, layered modulations in volume, tone, pitch and phase. Turning the table on which the whole thing was mounted to a different position caused all the planes of vibration to rotate, so points of the compass were not relevant, and weaknesses in the design of the mounting were the deciding factors about directions. What fascinates me is that even this crude model took about 52 to 56 cycles to turn a right-angle, so 104 to 112 for just one complete pattern of changes - very close indeed to the 1% I had hoped to find. Church bells also suffer from a false beat, which is appropriately known as "Bell Warble", and I attended a lecture by R. Porrin on "The Suppression of Bell Warble" at the London College of Furniture in 1977, which showed that the problem was caused when the bell was not precisely round, because of imperfections in its shape. As with my models, the bells would only vibrate without warble if they were struck along a particular line. An ideal, perfectly round bell would, of course, be symmetrical, but have no particular symmetry in one direction more than another. What, then, would be the equivalent for a string? Imagine it in cross- section, theoretically round, and mounted firmly, it should vibrate as easily in one direction as in another. In reality, strings are not perfectly round, nor are they clamped firmly in place, they have to be free enough to pull through the bridge for tuning purposes, so there is room for tiny amounts of movement to be biased in certain directions. Lateral movement is possible to imagine in almost any bridge design, but although agraffe studs are designed to hold the strings in placed by passing them through drilled holes, in actual fact, they are probably the least restrictive type when examined with a microscope, so perhaps that is why they so often suffer with false beats. The same kind of problem occurred with my models, whether rubber ropes or clamped wire, and as I experimented with the idea of encouraging faults to cause a bias, the false beats could be created at will. To create a false beat then, simply allow the string to move sideways on the bridge, so that its ideal perfect symmetry of movement is interfered with. Conversely, if a troublesome false string is held by sideways pressure above the top bridge with a screwdriver, it almost guarantees to remove the problem instantly! It is possible to wedge something between the top-stringing in a severe case. Quite how a bridge can be designed to prevent movement whilst allowing tuning, I don't know, but it occurs to me that all pianos have pin bridges at the lower ends of the strings, and since many pianos are not troubled by falseness, perhaps old-fashioned top bridges with pins and side- draught don’t cause falseness. Certainly, there are some modern pianos that are so false, they are almost untuneable. When the museum is more complete, I must make a detailed survey of our antique pianos, to see if they suffer much from falseness, but some old square pianos certainly do suffer from prominent false beats in the treble. I suspect that if the hammer did not strike at the tuneable end of the string, this might reduce falseness, and it is surprising that nobody seems to have made a pianoforte in which the strings are NOT struck at their tuned ends. Soon after I had published the original article in my Piano Archives Newsletter of March 1982, that ultimate source of scientific knowledge, an old Tom & Jerry cartoon, added its own footnote to these experiments: I watched open-mouthed as Tom hit Jerry around the head with a baseball bat whilst standing on his feet, and Jerry responded by vibrating in a perfect false beat mode, alternating his plane of vibration between North-South and East-West! Coiled springs will sometimes behave in this way, and one cannot help admiring artists who are such great observers of life that they so often catch the things we mere mortals miss! Modern Estonia grands are fitted with brass bridges on the backstringing, rather like the Steinway Duplex system. In the extreme treble, they are placed to a fairly accurate octave above the speaking length, but the next section down has them roughly an octave and a fifth above. What is interesting is that although people often say these devices have no appreciable effect on tonal quality, there is a very definite difference in tone between the two sections. Both suffer quite badly from falseness, and another interesting point is that the false beats are fairly equal on different strings of a note, probably because the brass bridges set the length of that part of the backstringing to equal lengths. Without donations, I will be fine, but our collection may not survive. If every visitor to this site made a donation, we would have better facilities when our museum is completed, and much-improved facilities for research within our own archives.